Every second year at team from GJFC travels to Western Australia to play Carine JFC in a practice match. The next trip is in 2020. So the WA2020 team has been formed. This is a great opportunity for players to travel to the other side of Australia to play football and gain an adventure at the same time. There are a number of events that are scheduled as part of the trip, however the main event is a boxing day with Danny Green. All players raise money through fundraising events to fund the costs of the trip. 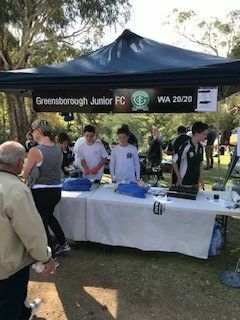 The GJFC WA2020 teams had their first fundraiser at the Eltham festival. The players and their families did an amazing job with some positive feedback from the public.